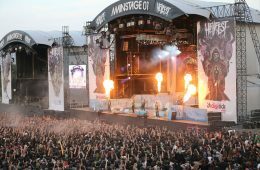 Fan-filmed video footage of reunited thrash metal pioneers DARK ANGEL performing on June 22 at this year's edition of the Hellfest in Clisson, France can be seen below. Commented DARK ANGEL drummer Gene Hoglan: "Boy, these DARK ANGEL shows have truly been incredible! To be playing again and hanging with the guys has been just awesome, as well as meeting all the fans! So many of you have so many great stories to share, it's been a real pleasure for all of us. "Y'know, DARK ANGEL has always been a strong brotherhood, and getting together again with the dudes has just increased it. And hey, even my Dad got to come to the Sweden Rock show with us! That's fun! He got to see the brutality of the traveling metal musician real up close and personal, but Dad's a total trooper, and he had a blast!" DARK ANGEL's current touring lineup: * Gene Hoglan (drums) * Eric Meyer (guitar) * Jim Durkin (guitar) * Ron Rinehart (vocals) * Michael Gonzalez (bass) During an appearance on the September 8, 2013 edition of the "Heavy Metal Mayhem" radio show, Hoglan spoke about the DARK ANGEL reunion, saying: "The most important thing for, I think, any of us, and especially me, and I know a couple of the other guys that are involved that the legacy of the band is very important. And if the band has attained some of kind of underground legendary status over the years, then if we do wanna return, a lot of people have great expecations of us, we'd better exceed those expectations. "Like Ron Rinehart said, the definition of 'good' is 'not bad.' [laughs] We don't wanna come out and even be great; we wanna be No. 1. And that's a very heartening attitude. "If some of the people that might wanna get involved with this… You've gotta do it for the right reasons. This is for the fans. And we're gonna come out and disappoint the fans, don't do it. If we're gonna come out and make the fans go, 'Yes, I expected something great and I got godly.' Then there's a reason for doing it." DARK ANGEL released two albums with Don Doty on vocals — 1984's "We Have Arrived" and 1986's "Darkness Descends" — before he exited the group and was replaced by Ron Rinehart (after a brief stint with Jim Drabos in 1987). 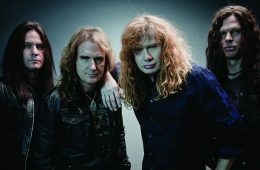 The band issued two more studio LPs — 1989's "Leave Scars" and 1991's "Time Does Not Heal" — before calling it quits in 1992. 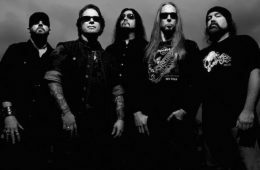 Rinehart, Hoglan and Meyer reassembled DARK ANGEL more than a decade ago but were forced to abandon their reunion plans after health issues reportedly put an end to Rinehart's singing career. Here is the Official statement that Hellfest posted concerning the band cancellations: "Recently, you may have noticed that the « Running Order » of the Hellfest 2014 edition tends to suffer of cancellations and/or schedule changes… Though we definitely take a lot of risks by programing more than 160 bands each year, we would like to make things clear in order you, the festival-goers, not to reconsider our main goal: satisfy YOU! Questions gush out on social networks: why all these last minute schedule changes? Why all these cancellations in such a short period of time? Be assured that we are the first to be awfully sorry to be forced to announce these “bad news”, especially since we are far from being the ones to blame… Indeed, all over the year, the Hellfest team works on the development of the site and the setting up of a coherent program, based on commitments founded and confirmed by the bands, via their agents and managers. All of that is an upstream work, more than 6 months (sometimes even more) before the opening of the doors. Personal reasons/pretexts, sudden unavailability, poor organization of tour routes, abusive financial re­-negotiations and ego/fame problems… any excuse bands can to avoid their commitments and to put sick pressure on the festival organization in order us to yield to their desiderata. The more the years go by, the more some artists grant themselves liberties and the “luxury” to change, by instance, their timetable at the last moment, without, of course, caring about the disruptions linked to this, and even less about the complainers it creates… which fall, obviously, on festival organization’s back. So today, thanks to all the (too) many negative comments we have to face, we have decided to say STOP, and that it’s our time to yell out. 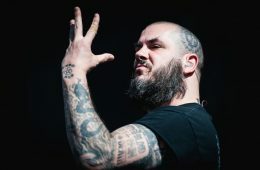 To yell out about all those artists who too often forget that the first reason of their participation to an event like the Hellfest is, before everything, to please the audience and to share emotions with YOU, the fans! And not to demand any preferential treatment that will, in the end, be prejudicial to all who make sacrifices to come applaud them! Since its creation, the Hellfest has always been a festival organized by fans for fans… And even if we sometimes have to give in under some bands lobby, the Hellfest shall always be a festival organized by fans for fans… We would like to apologize once again about the troubles caused by these last minute changes. But be aware that this kind of situations saddens us as well… Having said this, we have to once again announce “bad news”, because the bands ICED EARTH, MGLA, and ALUK TODOLO have just let us known about their cancellations… The bands BORGNE and BLACKLODGE shall stand in respectively for MGA and ALUK TODOLO. Hoping that all of that shall not tarnish the party we planned for the 20th, 21st, and 22nd of June in Clisson… Two weeks to go…"
Vocalist Mark Osegueda of San Francisco Bay Area metallers DEATH ANGEL has released the following statement: "It's with a heavy heart I have to inform you that the rumors you are hearing are unfortunately true... although there is a platinum lining to this black cloud of DEATH ANGEL's 2014 summer festival season. 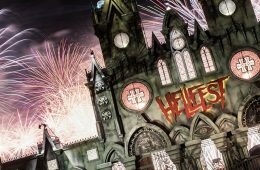 "The platinum lining is that we are very proud to announce is DEATH ANGEL WILL be playing Hellfest [in France] this year! 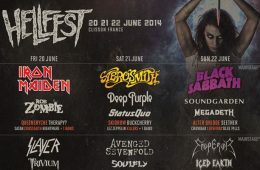 Hellfest will have the exclusive European DEATH ANGEL show this summer! However, our billing on that festival has been updated. We will now be playing on Sunday, June 22! (The BLACK SABBATH day!) 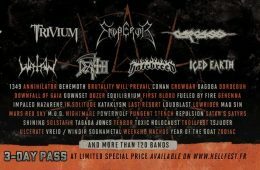 On main stage #1 in place of MEGADETH who unfortunately had to cancel… and we plan to give that slot on the bill, and you metal fans the damage it deserves! "The dark cloud, I must announce, is the rest of our summer festival has been canceled... and canceled by us. "I assure you this has NOTHING to do with the structure or strength of the band itself! We feel the band is at its live performing peak riding on the wave of our latest album, 'The Dream Calls for Blood'! It boils down to the infrastructure of the business side of this band… Certain aspects of how this band was being handled were no longer matching up to the quality level of product we are releasing, and the live shows we've been unleashing! And if we carried on that way any longer, it would have damaged the core of what is us, and that is the band! So we are taking this time to restructure our business team to make DEATH ANGEL the strongest band that we can possibly be from the outside to the core! "The lineup is intact! The hunger is voracious! And we will be back in Europe with a full-blown tour when we feel confident that we have the full arsenal, and team behind us that this band, and its music, and, most of all, you fans, deserve! "We are doing all we can to expedite this process! "I know some of you will not understand this aspect of the art form known as music! But it is a business. And hasty business choices in this art has brought down bigger than us.... And we have NO intentions of being brought down! "Some of you will have negative comments and thoughts... But believe me, no one is more saddened and disappointed about these cancellations than us... And if you have ever seen us live, I'm sure you can attest to our love for being on stage! That being said, we'll see you at Hellfest. And we plan on giving you a performance that night that will convince the naysayers that DEATH ANGEL is here to stay and a force to be reckoned with." 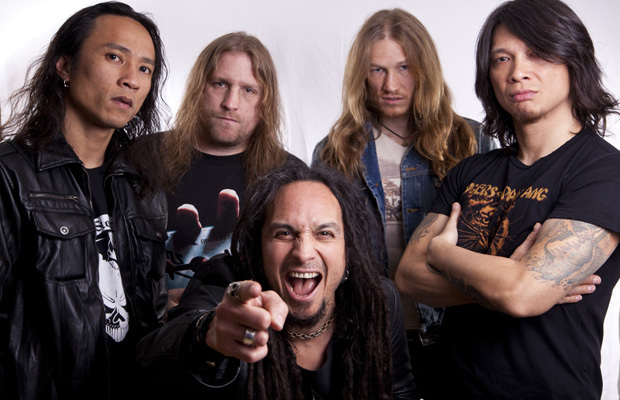 DEATH ANGEL's seventh album, "The Dream Calls For Blood", sold 5,400 copies in the United States in its first week of release to land at position No. 72 on The Billboard 200 chart. DEATH ANGEL's previous CD, "Relentless Retribution", opened with 2,700 units in September 2010. The band's 2008 effort, "Killing Season", registered a first-week tally of around 2,300. 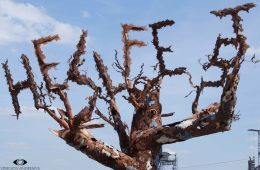 This number was in line with the performance of its predecessor, "The Art of Dying", which premiered with around 2,100 copies back in May 2004. Released on October 11, 2013 in Europe (except for the U.K. where it arrived three days later) and October 15, 2013 in North America via Nuclear Blast Records, "The Dream Calls For Blood" was recorded at Audiohammer Studios in Sanford, Florida with producer Jason Suecof (TRIVIUM, AUGUST BURNS RED, THE BLACK DAHLIA MURDER, ALL THAT REMAINS, WHITECHAPEL, DEVILDRIVER), and once again features cover art by Brent Elliot White (JOB FOR A COWBOY, CARNIFEX, WHITECHAPEL).